The information below will help you better understand what you should expect from your first credit counselling session. Once you have read through the provided information, call Consolidated Credit to get on your own path to financial recovery at 1-888-294-3130 to speak with a trained credit counsellor. You can also get started online by completing a request for a Free Debt Analysis. Choosing how you work with Consolidated Credit is a matter of personal preference. Although you can meet with a trained counsellor in person, many consumers choose to do their session over the phone or online because of convenience. The following chart provides a list of benefits of calling to speak with or visiting a credit counsellor directly versus taking the first step online. The credit counsellor will walk you through the evaluation process to avoid uncertainty. You can provide the information required to complete your debt evaluation at your own pace. There will be more transparency with what the credit counsellor is looking at in your finances and during the analysis process. You will have plenty of time to gather the account information you need without someone waiting for you on the phone. Without feeling rushed, you may be able to use accurate numbers for budget analysis instead of estimates. You speak with your credit counsellor early in the process so you can start to develop a relationship with the advisor who will be helping you get out of debt. You don’t have to complete your debt analysis in one session. If you are busy, you can complete the analysis in a way that works for your schedule. You can complete your analysis immediately so you can rest easier knowing that you have a clear answer about the right debt solution for your needs before you get off the phone or leave the office. Either way, your journey to financial recovery starts with a credit counselling session that analyzes your debt, the causes behind it and your budget to help you determine the easiest and most effective way out of debt. 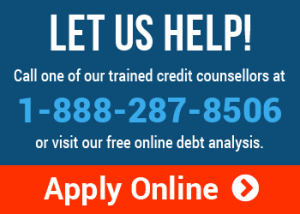 Your credit counsellor uses this information to determine the best way for you to get out of debt. Debt solutions can vary widely from one solution to the next, so a thorough analysis is always needed to determine ways to move forward. What to Expect When You Enroll? If a debt management program is decided to be the best debt solution for you, the credit counsellor will be able to tell you how much you will pay each month on your reduced debt payment and how long it should take to complete the program to help you get started. The credit counsellor who speaks with you to complete your first credit counselling session will be the counsellor you work with all the way through your program. Each month, you pay the credit counselling agency a single monthly payment, and they will distribute the payment amongst your creditors. On your behalf. In addition, the credit counsellor will negotiate with creditors to lower your interest rates and remove any penalties or fees that have been applied to your account. During your program, if you have further questions, your credit counsellor is available to help. Additionally, if you have a change in situation and have trouble meeting your monthly payment, the counsellor can assist you on how to stay on track.